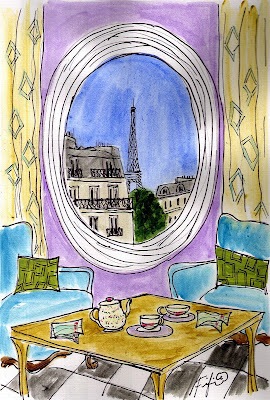 Stay tune for (2) Tea in the Garden, Tea at Ladurée, Tea in Bed, Tea et Books, and more! Don't Miss Out... ORDER TODAY!!! What a lovely place to have Tea. and what a view... :)) Looking forward to more. Your style is delightful – whimsical and bright. The way in which you use colour captures the French spirit..........so clever and appealing. And I do love your subject matter.